Princess Marie Louise of Savoy, Princess of Lamballe (Maria Luisa Teresa; 8 September 1749 – 3 September 1792) was born a Princess of Savoy. She was later married to Louis Alexandre de Bourbon a member of the House of Bourbon. In France she was known as the "princesse de Lamballe". She was a close friend of Queen Marie Antoinette. She, like the queen, was killed in the French Revolution. There was national hatred of the Italian-born princess who, along with the Duchess of Polignac, were part of the queen's inner circle. Maria Luisa was born in Turin in 1749. She was the daughter of a Prince of Carignan at the Palazzo Carignano. She was the sixth of eight children. Her father was a distant cousin of King Victor Amadeus III of Sardinia Maria Luisa's mother was a sister of the late Queen Polyxena. On 31 January 1767, she married by proxy Louis Alexandre, Prince of Lamballe. He was a grandson of Louis XIV's legitimised son, Louis Alexandre, Count of Toulouse. Louis was the only surviving son of Louis Jean Marie de Bourbon, Duke of Penthièvre. She had arranged the marriage. During plans for her marriage she was known as Mademoiselle de Carignan in France. In 1768, at the age of nineteen, Marie Louise became a widow. Her husband died of a venereal disease at the Château de Louveciennes. He was known to have been fairly promiscuous and had many sexual partners. His widow inherited her husband's considerable fortune, adding to her wealth. She kept her title of duchess in her own right. Her husband was buried at the Chapel of Dreux outside Paris. After the death of her husband she moved to Paris. She soon became a lady in waiting to Marie Antoinette, the new Dauphine. 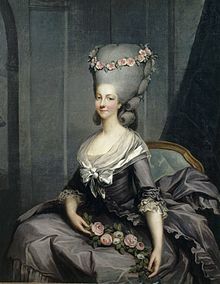 When Marie Antoinette became queen, Marie Louise became head of her royal household. She became a very close friend of the queen. During the decline of the monarchy she remained loyal to the queen. In 1789 the royal family was forced to leave the royal palace at Versailles. Marie Louise remained with them. She was in Bath, England but returned to Paris. When the palace was stormed in 1792, the royal family was arrested. Marie Louise was separated from the queen and sent to the prison at La Force. On September 3rd she was brought before a tribunal. It was demanded she sign an oath of loyalty to the New Republic. She also had to denounce the queen and the royal family. Marie Louise refused. She was taken into the streets and murdered. [a] Her head was placed on a spike and displayed before the queen in her prison cell. Her head was buried with her body at the foundling's cemetery. Arms of the Princess of Lamballe as a married woman. 8 September 1749 - 31 January 1767 Her Highness Princess Maria Luisa Teresa of Savoy. She used the name "Maria Luisa' or "Marie Louise" in French. As a daughter of the Prince of Carignan, she is often incorrectly given the surname of Savoy-Carignan. That is incorrect as she was born a princess of the Duchy of Savoy and a daughter of a Prince of Carignan. The title was merely a courtesy title having no legal jurisdiction over Carignan which was known in Italian: Carignano. ↑ A number of myths and popular stories exist about what was done to her body. According to official records it remained clothed and was not mutilated. This page was last changed on 31 August 2017, at 10:12.